That’s the outline of our of our three-week, three-sport trip to Cuba. A map can be viewed here. Yes, it was an active trip, but there was also time to relax and appreciate the heritage, musicality, and optimistic spirit of the Cuban people. An unexpected bonus: getting to know our congenial travelling companions from ten different countries. 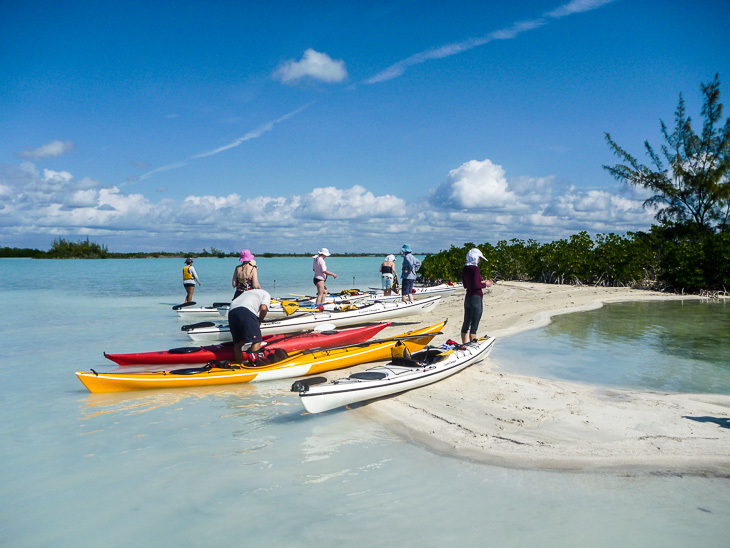 “Mucho working,” sighed Pepe, the naturalist who guided our kayak group through the islands and shallow waters of Las Salinas wilderness reserve. It was a long, hot day, as Pepe searched for a break through the mangroves to the open sea. Exotic birds, a massive bone fish, a conch graveyard, and some blue crabs were the rewards for our salty, sweaty efforts. After seven hours on the water, a motorboat brought us through a mangrove-lined waterway to a village of thatch-roofed cabins on stilts; Fidel Castro used to holiday here. Doug tasted crocodile meat for dinner: not disgusting, but one bite was enough. And this was just day one! 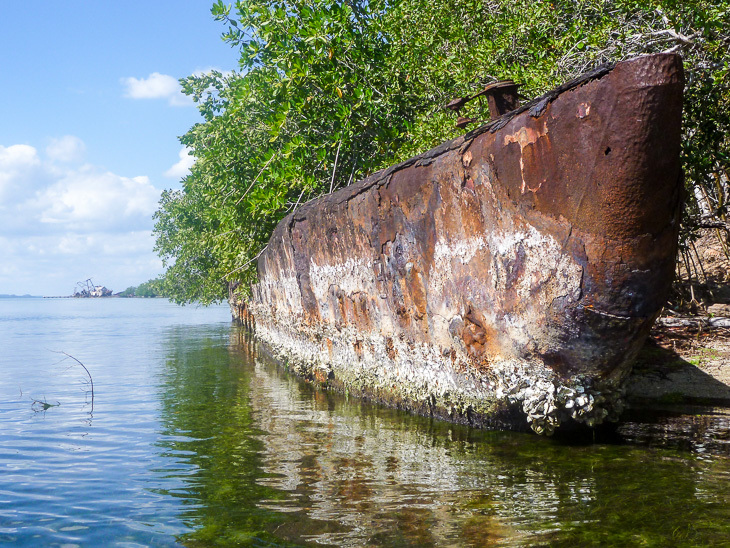 A jungle back-channel, a little-visited flamingo sanctuary, a graveyard of scuttled Russian submarines and ships, and a fjord-like mountain lake were the paddling destinations on the subsequent days of our one-week kayak trip. Snorkelling (lion fish! ), swimming, hiking to caves and waterfalls, and a salsa dance lesson were squeezed into the agenda. Somehow it was decided that Doug’s birthday should be celebrated early (he would be 74 on February 11). As we were singing Happy Birthday, a flaming rum cake appeared. Thank you, kitchen staff of Hotel Pasacaballo, for a memorable birthday. Before this trip we’d had very little experience in a kayak. It’s quite different from paddling a canoe, our boat of choice. Will we abandon the canoe? Absolutely not. But after one week of patient coaching (thanks, all), we have confidence that we can paddle a kayak (though imperfectly) when a canoe is not available. Eduardo caught a fish or two every day. He poured rum into their gills to kill them, the Caribbean way. Cuba is one of the world’s best spots for deep-sea fishing (remember Hemingway’s Old Man and the Sea? ), but an unexpected surprise was the exquisite way in which Eduardo prepared fish for every lunch and supper aboard our sailing catamaran. Pescetarians, this is your trip! Also aboard the 82-foot catamaran Neptune were skipper Pedro, CEO (Chief Experience Officer) Zsophia, and seven guests (including us). Pedro, an experienced yet laid-back skipper, allowed Doug to take several shifts at the helm. For one leisurely week we explored some of the Caribbean’s most beautiful islands, the Canarreos Archipelago in southern Cuba. Some of these islands were hide-outs for pirates and are said to have inspired Robert Louis Stevenson’s Treasure Island. Powdery white sandy beaches, mangrove forests, intense turquoise waters, iguanas and birdlife, snorkelling right off the boat to look at colourful fish…we had no trouble relaxing here. Neptune is not a cruise ship, although there was a towel animal on our bunk when we boarded. Passenger cabins are cozy (that means limited headroom and limited storage space). Each cabin has a small attached bathroom with a hand-held shower. 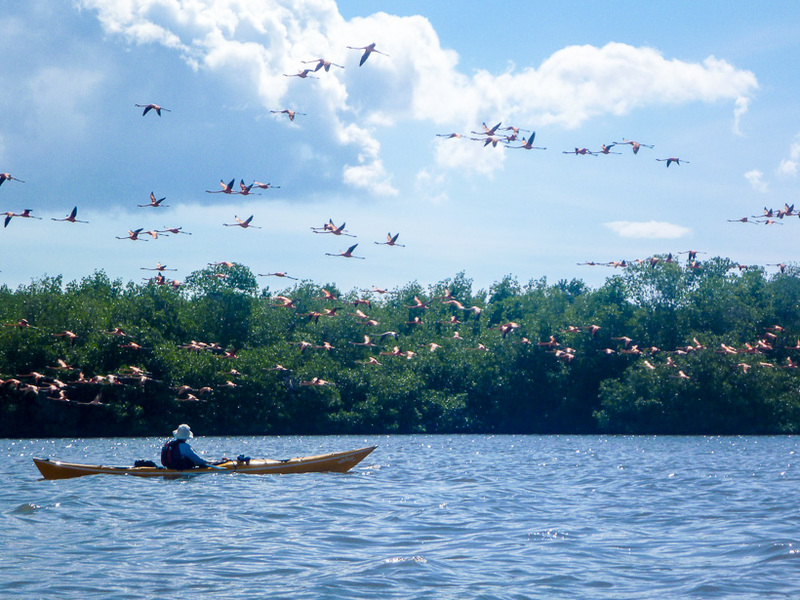 The catamaran carries three sit-atop kayaks; these can be used to paddle among the maze of mangroves, but stay centre-channel to avoid crocodiles! 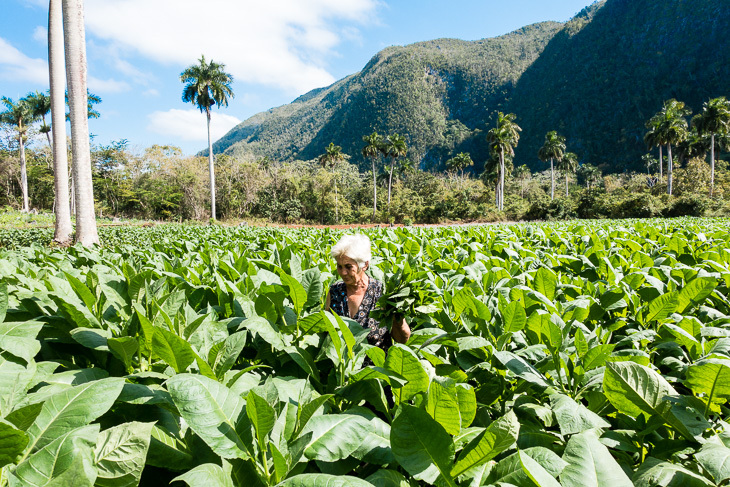 The scenery is stunning: otherworldly limestone hills called mojotes, red-dirt oxen-furrowed tobacco fields and subsistence farms, thatched tobacco-drying houses, sombrero-wearing cigar-smoking rural farmers on horse-drawn carts. 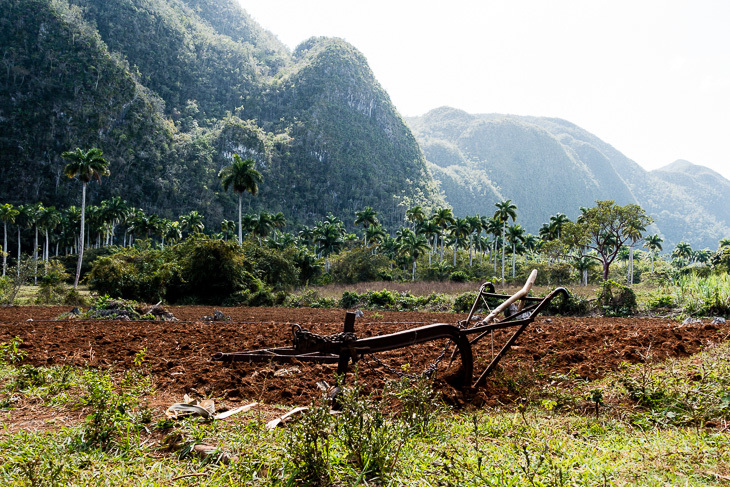 Cycling is the ideal way to discover the countryside west of Havana. Traffic is light, and the local dogs are friendly. Potholes in the road are the only significant hazard for cyclists; our bikes bounced and rattled as we rolled up and down the hills. Che Guevara: hero or villain? 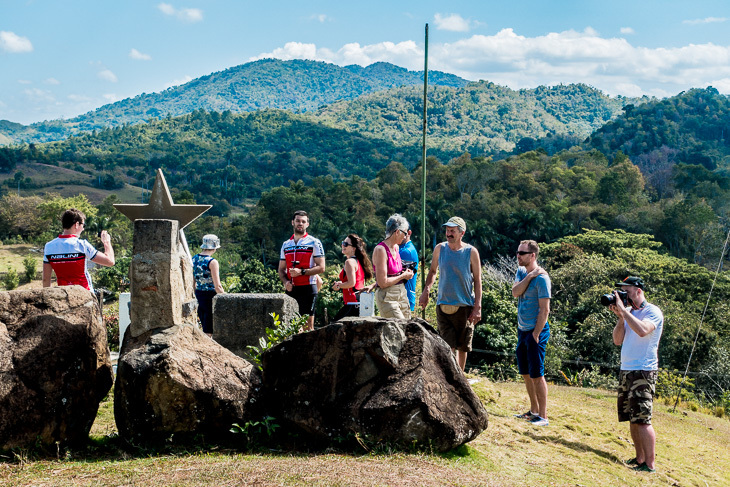 We heard evidence on both sides of this debate, as we visited Che’s memorial and the cave from which he commanded Cuba’s army during the 1962 Cuban missile crisis. 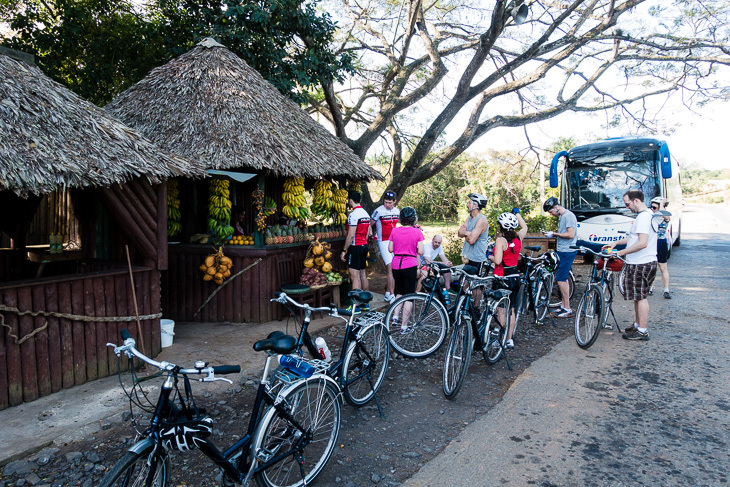 Two farmhouses, a tobacco plantation, a cigar factory, two city tours (Pinar del Rio and Vinales), a white-sand beach, Las Terrazas eco-resort, an orchid garden, and a rum museum were other stops on this action-packed one-week cycling tour. Did we mention hills? Some hills in this region are brutal, especially when it’s hot and humid. Twice we golden-agers chose to ride in the air-conditioned support bus to avoid hills (we skipped 10 km of the 62-km ride on day three, and all the hills on day six). Congratulations to the young, hardy five who conquered the final 17 km of steep hills in a deluge of rain! “This place is a photographer’s dream come true,” said Doug, as we began our walk around Old Havana. It’s like travelling back in time: old classic cars and colourful, weathered buildings, representing architectural styles from the 16th through the 19th century. 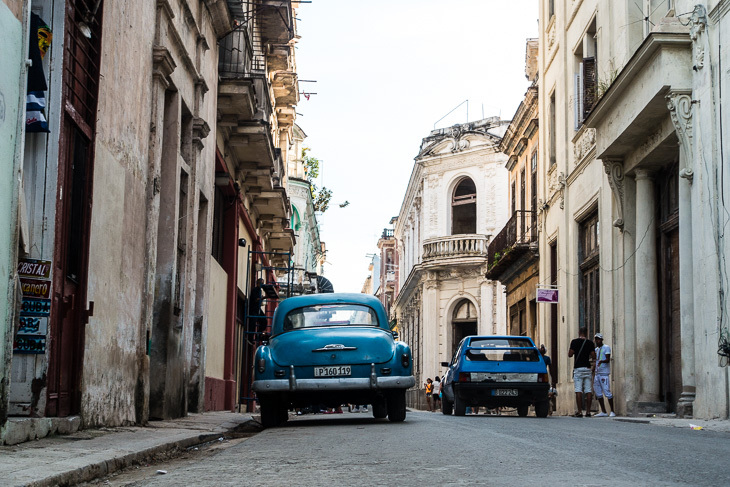 Covering some three square miles and hugging the harbour, Old Havana includes Spanish colonial structures, towering Baroque churches, and buildings in Neoclassic style. 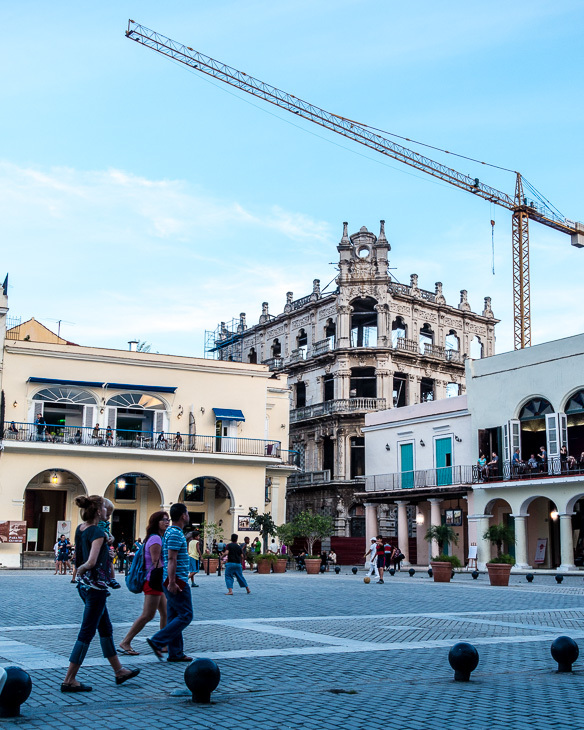 Old Havana is a World Heritage Site, and restoration is in high gear. In addition to architecture, Cuba has rhythm, and Cuba has soul. Everywhere there is music in the air: in the parks, at every street corner, in bars, and in doorways. Hot water in the shower, a toilet that flushes, a quiet air conditioner that works, light bulbs in every fixture, a toilet seat, good coffee, ice cream: every hotel has some – but never all – of these amenities. Schedules change for no apparent reason, and everything runs on a special time zone – Cuban time. “It’s Cuba, people,” tour guide Rommel reminded us several times each day. Do you enjoy a bit of uncertainty when you travel? Can you embrace the quirkiness of two-star hotels? If so, you will love Cuba. It’s a safe and friendly place to travel, and that is guaranteed – along with rice and beans. Australia, Canada, Cuba, Denmark, Germany, Hungary, Netherlands, Russia, Switzerland, United Kingdom. 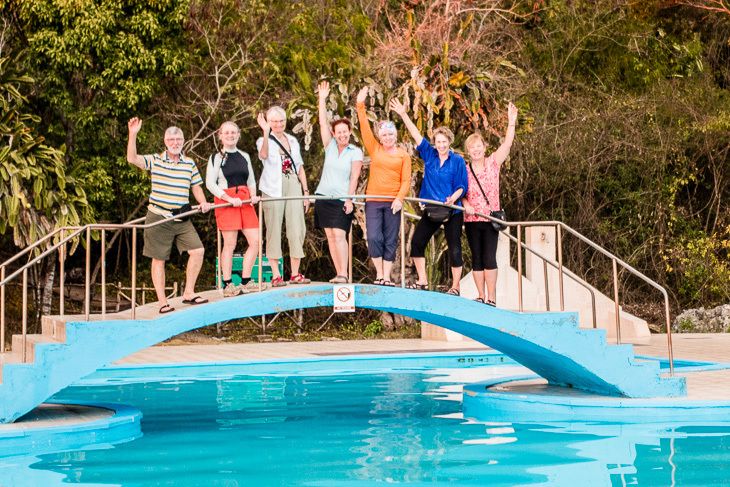 Our tour participants and guides came from ten different countries. We were the oldest folks by far. The sailing and cycling tours had youngsters in their twenties, not much older than our grandchildren. Each group clicked and quickly became a family, in spite of the differences in age, nationality, and background. The future of the world is in good hands! Yes, the young people liked to stay up late (didn’t we? ), but they were discussing the world’s political and environmental issues. Towards us they were respectful and genuinely interested in our life experiences and our goals for keeping active. 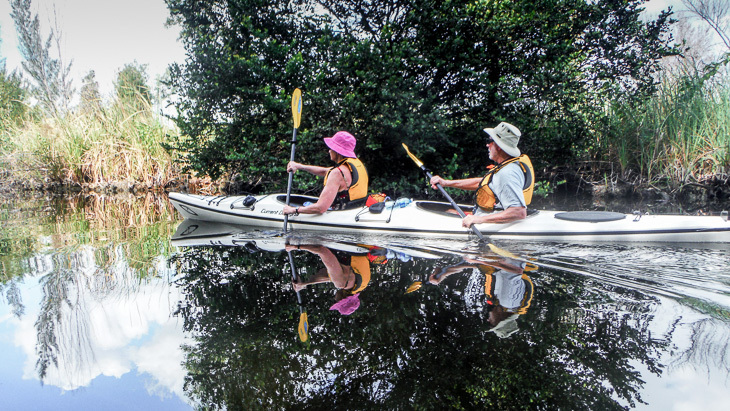 This entry was posted in Bikes, Boats, Boots, Cuba and tagged Cuba Kayak Adventures, Havana, Kayaking, Sailing. Bookmark the permalink. Simply fabulous! Thanks for the inspiration. Thanks Liz. We’ll try to keep up the pace. So we won’t see you in March in Singapore? Happy birthday, Doug. You and Alan could have celebrated together in Namibia. Darn. Oh yes, we’ll be in Singapore. Spending a few days there for lag recovery before boarding. Look forward to seeing you (assuming Insignia makes it). This is excellent. So glad you decided to do this blog! Love your photos! Thanks Wendy. Guess we’re still crazy after all these years. Great to hear from you–it’s been a long time! It’s amazing that you found us via a Google search. In just a couple weeks we’ll be leaving for a four month cruise. Sounds pretty decadent, eh? We’re trying to blow it all. Hope you will follow the blog. Loved your Cuba blog — it brought back so many memories and introduced lots of new and exciting places — How goes the cruise? We have to travel vicariously through you, while we content ourselves with the lovely life on Vancouver Island. Good to hear from you. Hope you are both well. We’re in Auckland today and it’s very cold and windy. A kayak tour we were on had to cancel due to storm force winds. Oh well, day after tomorrow is Tonga where the sun is shining bright (hopefully).